We now have a Support Board posted in our office! If you make a donation, your name goes on the board to let our clients see how wonderful our community support is! 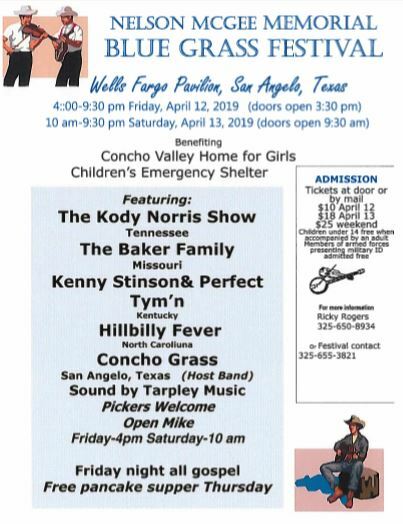 Please keep an eye on our Facebook page- Concho Valley Home for Girls/ Children’s Emergency Shelter for updates! Our dates have been set for the Bluegrass Festival! It will be held April 12th and 13th at the Wells Fargo Pavilion. Thursday night, April 11th is a FREE pancake supper! Friday, April 12th doors open at 3:30pm and the shows start at 4pm and run till 9:30pm. Friday night is all gospel music. Saturday, April 13th doors open at 9:30am and close at 9:30pm. Pickers are always welcome and we have an Open Mic on Friday at 4pm and Saturday at 10am.